2) Special Effects - Total Thumbs Up: The awesome special effects works starts almost instantly on this film. An innocent enough sight, watching a trapeze artist ply her craft, becomes so much more when suddenly we see an underlayer showing her bones and working muscles as she works through her routine. This was delicious fun especially especially during the scene where Igor and Victor meet - because they're both doing it at the same time! And Victor's treatment for Igor's hump? Ewwwww! All the effects for the cool experiments and science equipment were marvelous. The eyes Victor shows Igor when speaking of what he's working on were especially neat, specifically because they looked like nothing much but then they change! Add in the pulsating body parts, the first successful composite animal, and later a humanoid creature and there's lots to love. Throw in the gorgeous skies and storm clouds, exploding equipment, lighting, electricity gone wild - and you get a ton of super cool special effects all over the place. And wait till you see the lovely spanning views of CGI London and then the isolated castle in Scotland! 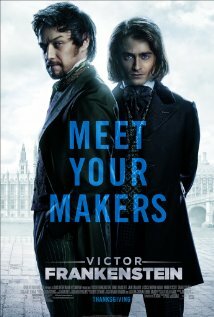 3) Plot/Story - Thumbs Up: "Victor Frankenstein" is a prequel of sorts. It basically fills in a lot about Igor and Victor before they get together in later years to create the monster we've seen in the book and the films. The entire thing is from Igor's point of view - which made this a refreshing take on the old tale. A few bits will jar a little - like the fact Igor is treated like trash yet he also becomes the circus's medicine man, which should have garnered him some respect or respite from his peers, since you might someday end up needing him to treat you for an injury. Also, how Lorelei comes to find herself a patron while recuperating at the hospital is not quite clear. They are little things though and easily ignored. Though the creature does not take the stage in this prequel, worry not, as there are two other patchwork monsters they get to play with. And it's fun watching Igor evolve while Victor seems to devolve. Two halves of a whole - the two men compliment each other, making them together more than each would be alone. While some details don't jive as they should to fit with the later tale, you can see bits and pieces of other renditions and characters flashing by in this one. A nice ying and yang effect occurs between Victor and Inspector Turpin - both obsessive and shaped by death but pushed in totally different directions. And both somewhat mirror the very chase Victor will later have with his final creation in the novel. As in Mary Shelley's original, the themes of religion vs. science, life vs. death, how we are perceived and acted on vs. who we truly are, are intertwined throughout the film. 4) Stunts - Total Thumbs Up: Amazingly, the film has lots of opportunities for the stuntmen. The madcap chase in the circus, another at the medical college, and even more stunts at the castle in Scotland - the stuntmen are kept quite busy. 5) Location/Cinematography - Total Thumbs Up: Lots of real and touched up locations in the film taking us to London, to Scotland, and more. Igor's first true view of the city of London was spectacular - showing both the good and the bad at once and also showing the thriving, human filled city. The old castle overlooking the sea in Scotland made for some great shots and doubly so when the storm is coming. The cinematography made good use of everything. Lovely! Conclusion: "Victor Frankenstein" is a refreshing take on little covered areas of the old tale. Between the costumes, the cool special effects, the lovely vistas, and the great acting, seeing it is definitely worth it.